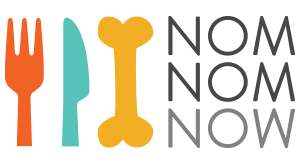 Delivering the freshest food possible is at the core of what we do here at NomNomNow, which is why we cook our food for pets every week in our self-owned kitchens in the San Francisco Bay Area and in Nashville. We believe in overseeing every single step of the process and holding ourselves to a high standard of food safety and freshness! When you order from NomNomNow, your food is always made to order — always fresh and never taken from a frozen, dehydrated, or freeze-dried batch! We always send your pet's perfectly portioned meals just days after they've been prepared just for them.